Flow chart of General Staff. 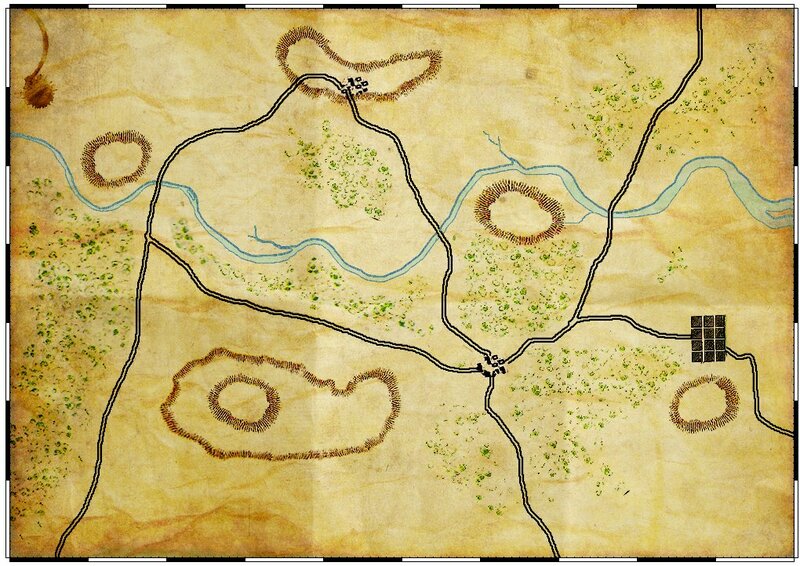 From the main screen the user can either create a new map, create a new army, combine a map and two armies into a new scenario or play a previously created scenario. Click to enlarge. This module provides all the tools that a user needs to create detailed, authentic-looking maps. The are numerous tiles that represent the eight different terrains (field, water, swamp, city, woods, bridge, road, fort). Additionally, the user can sculpt hills and ridges with the AI automatically adding ‘splash contours’. 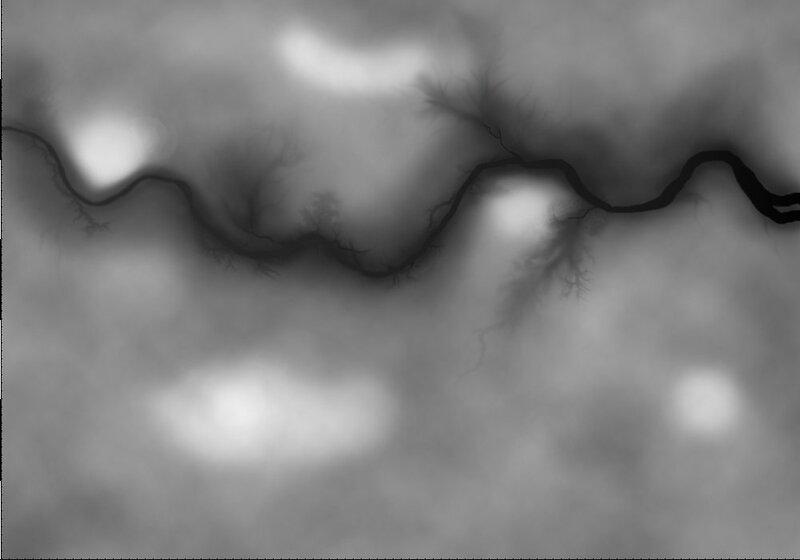 Rivers and roads are added using a Bézier curve tool. 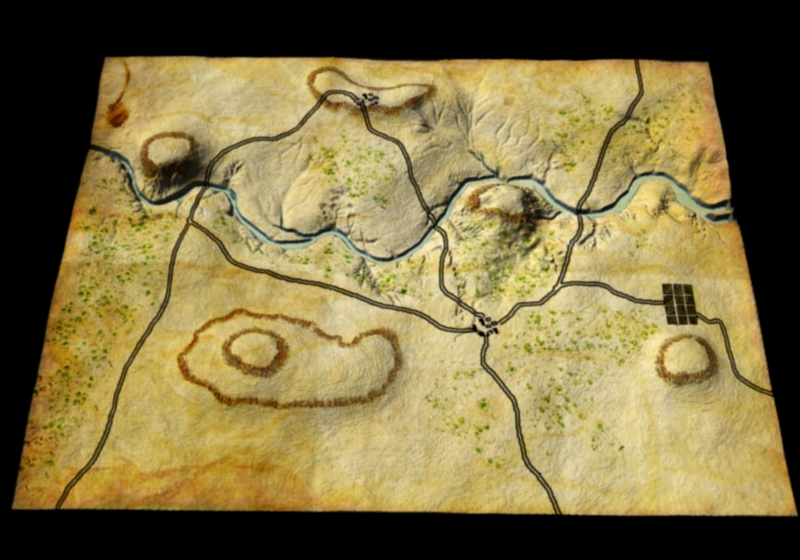 After the map is completed the user can select the amount of ‘dirtying’ (map folds, coffee stains, age stains, etc.) to be added to the map. Armies can be in either an hierarchical format (see below) or a flat format. A flat format is a data structure without layers of commanders. Next week we will be running a user survey to find if you have a preference for hierarchical or flat army unit structures. Screen shot from UMS II: Nations at War showing a hierarchical army structure. There are four levels of command in this army structure: Army Group, Army, Corps and Division. Click to enlarge. The original UMS had a flat army structure while UMS II had a hierarchical unit structure. For both systems an intuitive click and drag interface is provided for quickly creating, editing and saving armies. Available unit types include: heavy and light infantry, heavy and light cavalry and heavy and light (horse) artillery. Headquarters and courier units are provided for hierarchical army structures. 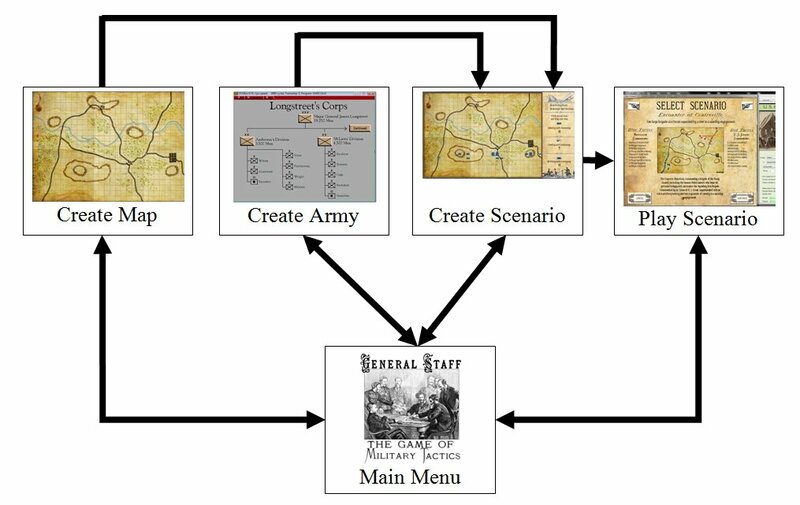 In the Create Scenario Module a user can combine any two previously created armies with a previously created map to create a new scenario. Mix and match to your heart’s content! The Napoleonic Imperial Guard against the Army of the Potomac’s First Army Corps on the Gettysburg battlefield! The battle of Marengo re-fought with Russian and Austrian troops! Obviously, you can also create historically accurate scenarios, too. This entry was posted in Game Design, Gameplay, Scenarios, Wargames and tagged Armies, Features, Maps, Scenarios on December 23, 2016 by EzraSidran. Well, it’s definitely 3D. But, it appears to me, that we’ve lost more than we have gained. 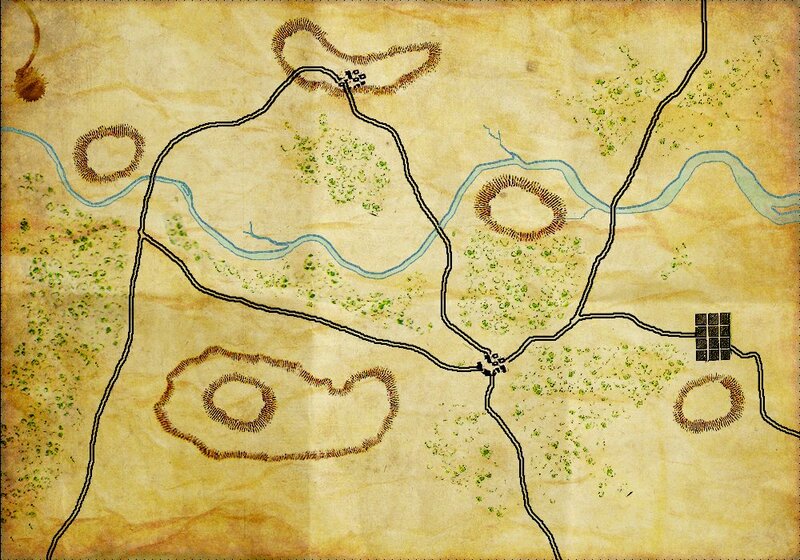 The user hasn’t acquired any new information; hills, rivers, ridges and valleys were all quite apparent in the 2D map. We’ve also lost that wonderful historical Kriegsspiel feel of Victoriana typography and cartography. Our 3D display looks like a wrinkled pigskin and not a map that was used by the General Staffs of the great armies of the world. Also, not being in 3D will facilitate porting General Staff to smartphones. We certainly would like to hear your opinion. But, as things stand now, General Staff will be moving forward in 2D. This entry was posted in 3D, Artwork, Game Design and tagged 2D, 3D, Game design, Maps on July 17, 2016 by EzraSidran. Latest Look at General Staff! Screen capture of General Staff on April 28, 2016. Click to enlarge. 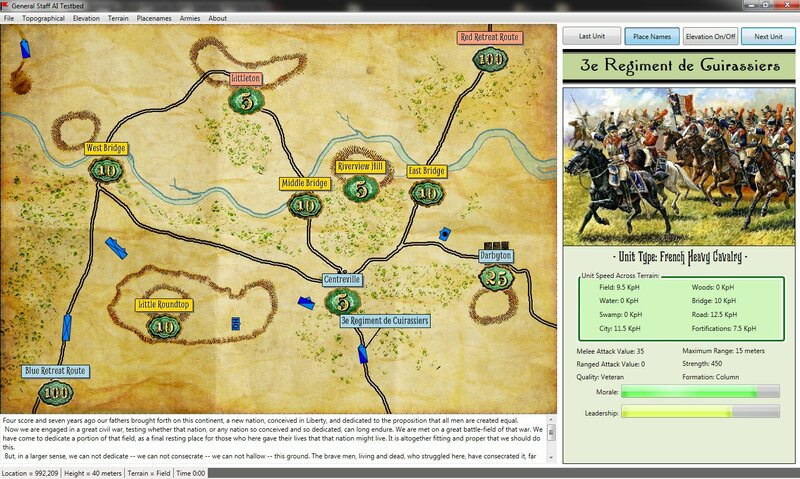 We are very pleased to show the first actual screen shot from the development of General Staff. This will give you a good idea of what it looks like and how it works. Currently, General Staff is in 2D. We’ve always planned to have it in 3D but, frankly, this looks so great as it is we’re thinking that maybe we’ll just have a 3D view option. Either way, as you can see the elevation display in the lower left hand corner, we have a complete 3D map of the battlefield ‘underneath’ the gorgeous topographical map made by Ed Isenberg. We will use this data for calculating line of sight and movement. The 3D height map for the above topographical map. Click to enlarge. Other interesting gameplay features that are visible in the screenshot: there are certain areas of each battlefield that are worth ‘victory points’. This will help establish the goals for the battle. The most important ‘victory points’, however, are the Red and Blue retreat routes. We anticipate shipping with about 20 different battles from ancient history to the 19th century. This entry was posted in Artwork, Game Design, Gameplay, Wargames and tagged Design, Maps, Screenshot on April 28, 2016 by EzraSidran. 2D or not 2D (that is the question). Let’s just start off by saying that General Staff will be in 3D. It’s the only way to display the blocks that represent units. But the question is: should the map be flat with just 3D unit blocks (simulating the original Kriegsspiel ) or should we employ a technique that I used for a project for the U. S. Army in which a 2D topographical map was used as the skin for 3D elevation that was extrapolated at runtime from USGS (United States Geological Survey) data? A screenshot of a project that I did for the U. S. Army. Click to enlarge. There are certainly pros and cons for both ideas. Frankly, I like the idea of using a flat, 2D, map with only the unit blocks in 3D. However, the one thing I don’t like about ‘traditional’ Kriegsspiel is that the unit blocks are rigid and always perfect rectangles that do not conform to map contours or allow units to change formations. On the other hand, I’m concerned that if we go full 3D (like in the above screen capture), it’s going to be to similar to current 3D wargames (I won’t mention names, here). I’ve tried to keep the overarching theme of ‘simplicity’ for General Staff in clear view. 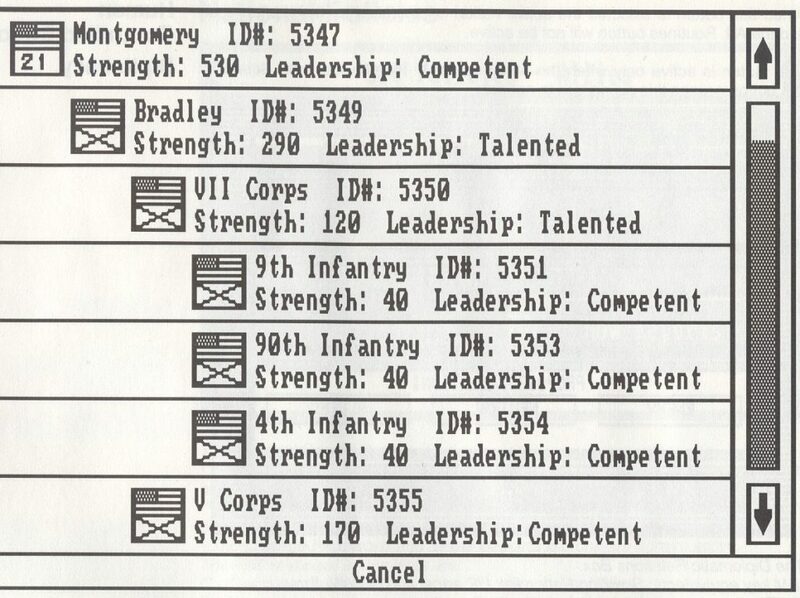 General Staff is supposed to be a fun, simple game where the graphics don’t get in the way of a pure tactical, enjoyable real-time game. Either way, we will be employing my optimized 3D Line of Sight (LOS) algorithms. That is to say, units behind ridges will not be visible to opponents. What do you think? Send us a note or leave a reply. This entry was posted in 3D, Game Design and tagged 2D, 3D, Maps, topographical maps on February 22, 2016 by EzraSidran. What does General Staff look like? I tell my students that one of the first things they should do when creating a game is design a logo. This may not seem obvious or logical. Probably a lot of people leave designing a logo towards the end of a project. I think this is a mistake. Once you have a logo it shows everybody working on the project exactly what the feel and image is we’re working towards. For General Staff I wanted a 19th century feel; something that brought back the original Kriegsspiel, old, faded maps and general staff officers in Napoleonic and Victorian uniforms. The type that I chose (Blaisdell and K22 Monastic) are classic Victorian fonts. The image in the logo is an engraving of the original Kriegsspiel being played; presumably in Prussia. When you look at the General Staff logo it is obvious what the game looks and feels like; this is not a zombie chasing game, this is not an RPG, this is not Lara Croft, Tomb Raider (games that I all like and play, by the way). General Staff is a thinking game. It is a tactical game. Ed Isenberg did a fantastic job creating the first map for General Staff. He perfectly captured the feel of playing Kriegsspiel on an old map; complete with coffee stains and map folds. The first General Staff battlefield. Click to enlarge. This entry was posted in Artwork, Game Design and tagged American Civil War, Artwork, Design, Maps, Tactics, Typography, Victorian on February 21, 2016 by EzraSidran.